My kids have always loved learning, and I try to encourage that with the types of games, activities and toys we have in our home. Now that we’re homeschooling, it’s even more important! If you have kids who love to learn then you’ll love the incredible ideas in our newest Holiday Gift Guide: Gifts for Learners & Homeschoolers. Whether their interest is in science experiments, studying astronomy, life and nature exploration, learning to code or robotics, we’ve got a bit of something for everyone on this list. 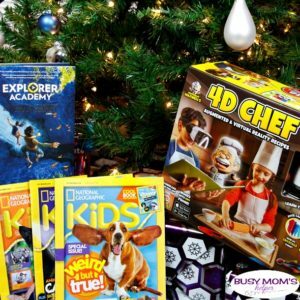 Pick your favorite gift for a kid who loves to learn, or for your homeschool kiddos! Kids can get immersed into this fun 4D Kitchen while creating 18 interactive recipes. They come alive in augmented and virtual reality, and Professor Maxwell (the 4D Chef) helps teach them the science behind food – they’ll love exploring the wonders of food science while trying new recipes. There’s a ‘lesson behind every bite’ – so give it a try! Kids will have great fun when they build, then flip, this remote-controlled vehicle! The 30-piece geomagnetic set has turbo motors which allow it to zoom and spin all over – as well as FLIP over! Learning is super fun with this robot featuring bright colors, strong magnetic pieces and a (patented) double-safety system. Use the included building guide, or let your kids use their own creativity to build different versions with the included pieces! This entertaining bot – weighing less than 2 pounds when fully built – flips whenever direction is changed form forward to back or vice-versa making for hours of learning fun! Kids can test out their code-cracking with Mastermind, a challenging game of logic and deduction. Try to crack the code in 10 moves or less, or create one that cant’ be cracked! It’s a great stategy game and one of the world’s most popular games ever. It’s easy to learn, fast to play and has thousands of possibilities, making it different every time you play. For 2 players, ages 8 and up. Whether our kid loves adventure, learning, reading or just trying new things, they’ll love this new book by Trudi Trueit brought to you by National Geographic! This first title in what will be a 7-book middle grade series was inspired by actual, real-life missions of the National Geographic Society. Inspire your kids to adopt a mindset of an explorer to set them up for a lifetime of adventure! Who doesn’t love a great wordsearch game? With this exciting version, turn a solitary activity into a fun group game as players go on a word search. The specially-designed circular board rotates to reveal the word they’ll race to find on that turn. You can even create your own custom Wordsearch cards with the online Puzzle Generator! Visit http://www.wordsearch.eu and enter up to 20 of your own unique words to generate a customized puzzle board; then download and print. For 2-4 players, ages 7 and up. What do your kids love learning about most? This post is sponsored by the Mom It Forward Influencer Network on behalf of Explore, Discover & Grow. All opinions are mine alone. Hubby and I were discussing the differences of when we were kids, and now our children’s youth. At school a lot of things were paper and pencil, not tablets. We had way more recess than schools now seem to, as electronic time is slowly taking over. Last year at school, there were so many days my kids would say ‘we didn’t do recess outside today, they had us stay inside and watch a movie’. And if you’re wondering the same thing I did, no it was not an educational movie, just a fun one that’s only purpose is to entertain. What about movement, or learning? This is why parents need to be mindful of Balancing Digital Entertainment for Kids – because although technology, movies, games and such are great and fine, there needs to be a balance with the kids actually being active and learning, too. Growing up, the norm was for parents to send their kids outside to play – often times until the street lamps would turn on in the evening. Now, kids spend more and more time in front of a screen. Y’all know I love movies and games, especially with my family, but I also know how important it is to not overdo it. Television stations now aim for an 80/20 ratio, with 80% being just entertainment and 20% being education entertainment. If you ask Greg Page – known globally for his role as the original Yellow Wiggle from the children’s entertainment group, The Wiggles – he thinks it should be closer to 50/50. It’s all about balance! In an effort to bring more quality, educational fun to kids’ screen time, he’s leading a revival of children’s educational television with Explore, Discover & Grow. Greg knows from his many years in early childhood studies and as a teacher that kids learn better by DOING. Too many shows just entertain while the child just sits there. But shows such as Dora the Explorer and Blue’s Clues have shown us how much more excited kids are when they can feel like a part of the show, and be active along with the characters. By involving the kids in the story or activities, they’re also more likely to LEARN and actually retain the information – plus have fun along the way! The more senses they use, the better what they learn is stored in the brain, plus the better they understand it. That’s why he’s been working hard to bring Explore, Discover & Grow to kids – this series of 104, ten-minute videos will be released directly to subscribers 2X per week, making it the perfect length for young kids’ attention spans. Parents can help bring some balance to digital entertainment for kids with this great series, which will use music, movement, language and play – making it a great ‘edutainment‘ experience for young kiddos. Kids as young as 2 will enjoy the colors, sounds and active motions included, and preschool children will have fun, engaging and educational content that’s designed to teach the whole child. Since it’s created by a teacher with actual experience in applying educational theory in entertainment for over 27 years, you know it’ll be high quality and be perfectly catered to the learning abilities of these younger children. And guess what? YOU can be a part of this amazing revival by backing their Indiegogo campaign – and you’ll get access to all of the content created! The campaign is now live, and they’re counting on parents like us to help them bring good, educational entertainment back to today’s kids. The closer to their funding goal they’re able to get, the higher quality they’ll be able to produce, so we’re trying hard to help raise awareness – not just here, but all over the world for English-speaking families! Greg’s determination is remarkable, and after having a really great chat with him (at 2am his time, since he’s in Australia – thank you Greg!) to learn more, I really believe this will be the next great screen time show for preschool kids! He’s working hard to make this a reality, and has already created about 60-70 songs for the series. They have a full plan for the coming year to produce and release these great videos, and his hope is that if they can make the first year successful and as high-quality as planned (with your help by supporting their Indiegogo campaign), the second year can help open up possibilities for others out there with great ideas on quality, educational entertainment for today’s little ones. With more and more non-educational screen time being thrown at our youth all the time, this could really be the start of showing the world that us parents want better for our kids – that we WANT balance in digital entertainment for our children! See more fun for Explore, Discover & Grow on Facebook, Instagram or Twitter! As many of you know, we decided that we’d homeschool our kids starting this year. All five of them! Yes, we’re crazy – but this decision came after several years of looking into things, considering all the pros and cons, and making our own lives and jobs work so that we could do this. We’re two months in, and so far things are going fine. There’s still many bumps to figure out and adjustments to be made, but we’re learning and growing together, and will probably tweak things all along the way. If you’re unsure about Starting Homeschool, here’s some reasons WHY we made this choice! First of all, I’ll be honest and say that one of my kids we’re only homeschooling because we moved far enough away from his school that we couldn’t make the drive there/back work. It was an AMAZING school (one of my girls was there 4th-6th grade, and that’s as high as they go so she finished it as well), dual language, very arts, creativity and STEAM focused. We loved it, and if we lived close enough he would still be able to go there – but sadly, it’s a minimum of 25 minute drive each way, which just couldn’t be worked out. So if you’re at an INCREDIBLE school that you love, homeschooling may not be for you. 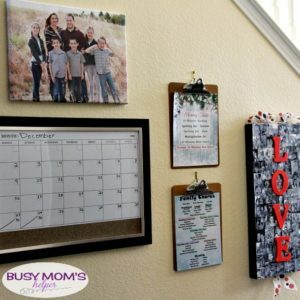 More flexible schedule – for the family, learning, vacations, activities/extracurricular, etc. More hands-on learning opportunities – such as field trips of our choice (and more time to do them), etc. There’s other reasons, of course, but these were the largest. Last year, one of my kids’ teachers said that she had finished that year’s math already so she had handed her the math book for the next year to work on ahead. School just couldn’t keep up with HER actual learning pace, same with another one of my kids. They needed more challenge, and the ability to move forward instead of sitting waiting for a classroom to catch up. And the reverse, some kids need MORE help or to go slower in certain subjects – but again, you have to go by the classroom speed. Homeschooling gives us the freedom to give extra help, or allow faster progress, as each child needs it. Now, while there’s plenty of beneficial things to homeschooling (otherwise we wouldn’t have chosen this option), there’s also some cons. It’s extremely difficult fitting my own work into the schedule when I’m assisting kids all day, or just having them home instead of getting to focus on my to-do list. I’ve had to cut back some, and it’s a constant tug-of-war with priorities. The kids and I do frustrate each other sometimes because we’re together ALL DAY, EVERY DAY. So while it’s great having that relationship building and time together, it’s not always roses. There’s also costs – supplies, programs/educational material, etc. You have to put up with questions A LOT from people who think homeschooling isn’t the right choice. We have to be active to make sure they get OUT of the house and socialize with others enough – between church, friends and their extracurricular activities, though, so far there’s been zero worries on that front. It can also be frustrating when the kids see each other doing better or worse than them, and have to teach them it’s okay to be different so they don’t make it an awful competition. Two months in, and still when people ask how it’s going my answer is usually “nobody’s died yet!” That sums it up in a nutshell – while we’re still thrilled with our decision and things are going great overall, there’s still the frustrating or overwhelming times, the moments we just want to have SPACE from each other, and the general tweaking and figuring things out we will probably be doing the entire time. So if you’re thinking of starting homeschool for your kiddos, definitely consider it strongly and make the best choice for YOUR family – but know that while there’s many benefits (I believe they outweigh the cons), there’s still going to be headaches. Nothing’s perfect, right? Coming soon – what we did to actually START homeschooling! Legal stuff, organizing, etc.